In a 10-acre private estate, on the banks of the River Tweed, this 19th-century baronial hall is now a luxurious 4-star country house hotel with an indoor pool and an award-winning restaurant. In the heart of the Scottish Borders, next to historic Dryburgh Abbey, this magnificent country house dates back to the mid-19th century. Today, the Dryburgh Abbey Hotel houses spacious, individually decorated en suite rooms, all with their own unique charm. All of the comfortable rooms have TVs, complimentary beverage trays and luxurious toiletries and bathroom products from Gilchrist and Soames. Many rooms have magnificent views of the River Tweed and the hotel gardens. The impressive leisure and relaxation facilities include a sauna and an indoor heated pool, kept at a constant 87 degrees. For keen anglers, the hotel boasts trout-fishing rights and direct access to the River Tweed. Looking out over the river, the Tweed Restaurant has been awarded 2 AA Rosettes for the quality of its cuisine. Set in 25 acres of grounds and mature woodland on the edge of the Scottish Borders, this impressive castle offers magnificent views over the surrounding countryside. Overlooking woodlands, gardens, waterfalls and ponds in the Peebleshire countryside, Barony Castle is just 17 miles from Edinburgh, making it ideally suited to those wanting a peaceful break with the option of being close to a main city and the Scottish Borders. 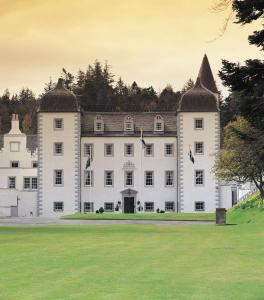 Behind its impressive stone fa?ade, Barony Castle provides a modern hotel, equipped with all the traditional comforts a discerning traveller would expect. 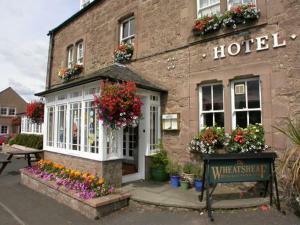 The welcoming Wheatsheaf provides peaceful, good-value accommodation and has 2 AA Rosettes for its food. It is located near Berwick-upon-Tweed, Coldstream, Duns and Kelso. The husband-and-wife owners, Chris and Jan Winson offer a warm welcome to the Scottish Borders. There are 10 bedrooms with superior en suite bathrooms, and Wheatsheaf has achieved an overall rating of 84% from VisitScotland for outstanding standards in food, service and ambience. The restaurant's fresh seafood comes from Eyemouth Harbour just 12 miles (19.2 km) away, and meat comes from local butchers. There is a selection of 150 wines and 48 malt whiskies to enjoy by the log fire. Clovenfords is an 18th-century coaching inn, 1 hour from Edinburgh, well placed for touring the Scottish Borders and awarded Hotel of the Year 2009/10 by The Shires Magazine. Clovenfords Hotel is 3 miles (4.8 km) from Galashiels, close to fishing, golfing and hill walking.